Antique curtain rods for tab top curtains, eyelet curtains or pinch pleat draperies. 8 foot reeded 1 inch metal curtain rod. Wrought iron curtain rod look. Some colors are more than base price. Perfect when used as a valance curtain rod support. For 1 3/8" pole. Kirsch's reputation for quality and elegance was built on Wood Trends. These classic styles in rich colors and subtle grains complement wood furniture finishes and architectural details, allowing for a totally original design statement. With a wide assortment of components such as elbow brackets, swivel sockets and holdbacks, Wood Trends is not only timely but also functional. Kirsch's inside mount socket wood pole brackets allow you to install your 1 3/8" wooden curtain rod pole inside the window casing. An excellant inside mount wood drapery pole bracket. For Estate Ultra 2" Decorative Traverse Rod and the Architrac 94001 track system. For wall mount, clearance 1 1/2", returns 3 1/2".Use with the 94001 Architrac system. Bulk price 10 each. Superfine traverse rods. Rod only. Two way draw. Hardware brackets, supports and tension pulleys must be ordered separately. 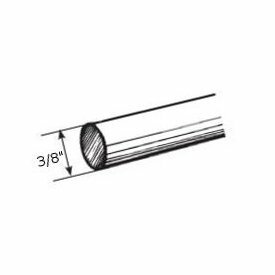 3087R-025: Bulk rod only 86"-150"
Arched curtain rods clear, non cracking vinyl 28" to 48"
Clearance 3/4", color clear for use with just about any decor. Use with your eyebrow or arched window. This flexible, curved curtain rod is used on windows of many shapes including round. Snap in clear brackets are furnished for installation. Rod ships flat, bends to the window contour for installation. One piece 48 inches long, can be cut to size. Arched drapery curtain rods for special windows. Clear curtain rods. Measure the contour of the arch. Rod size is flat length of the rod. In stock, ships in 2-3 days. 4-024-1: Arch top oval octagon and circular windows curtain rod kit to 46"
7015-058: Arched curtain rods for curved windows, clear 48" to 86"
Custom drapery rods by BasicQ. This is an assembled Cut To Measure set. Choose the length in feet and inches in the size dropdown. Base price includes first three feet. Made to measure bay window traverse rod. Bay window drapery rods by Graber. Minimum 3 feet charge. Custom Pricing Per Foot. First three feet included in base price. Note: Measure at window, make no deductions. D is from where brackets are to be mounted. Factory will make proper deductions based on your selected projection. (window to front of rod). Maximum fabric weight on two way operation is 35 pounds, on a one way operation it is 22 pounds.